South Texas College’s Starr County Campus Library Art Gallery presents “Facilitating Crises,” an exhibit featuring the mixed media paintings of M.C. Farris. The exhibit opens Thursday, Feb. 2 and will be on view through Friday, May 11, 2012 at STC’s Starr County Campus Library Art Galley which is located at 142 FM 3167 in Rio Grande City. Admission is free and open to the public. M.C. 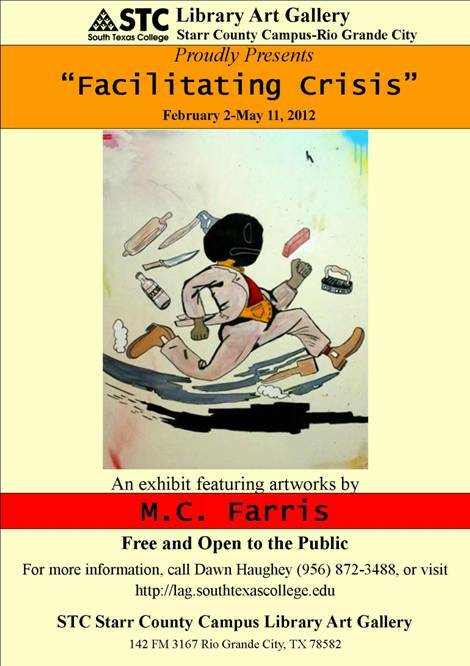 Farris is a professional artist and an assistant professor of design art at The University of Texas-Pan American. He earned his master’s in painting from Texas A&M University and his master’s of art education from Texas Tech University. His work has been exhibited both nationally and internationally.